BGP stands for Border Gateway Protocol and it’s a routing protocol. BGP is an exterior gateway protocol that’s designed to exchange routing and reachability information and connects autonomous systems (Autonomous system is a collection of connected Internet Protocols). Currently the internet is working with the help of BGP. BGP mostly used by ISP (Internet service Provider). BGP not link state protocol and not distance vector protocol, BGP is Path vector routing protocol but sometimes also classed as a distance-vector protocol. 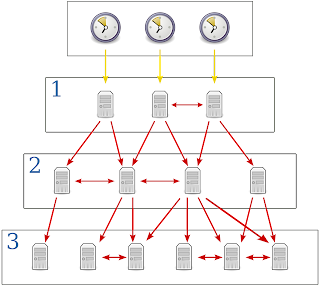 The BGP makes routing decisions based on path and network policies. BGP is also making core routing decisions. BGP has been use on the internet since 1994. Version 4 is the current version of BGP and this version was published as RFC 4271 in 2006, after progressing through twenty drafts from documents based on RFC 1771 version 4. RFC 4271 corrected errors, clarified ambiguities and updated the specification with common industry practices. The major enhancement was the support for Classless Inter-Domain Routing and use of route aggregation to decrease the size of routing tables. BGP used for routing in autonomous system. BGP version 4 is standard of internet routing. BGP required of most internet service providers (ISPs) to establish routing between one another. Very large private use BGP internally. 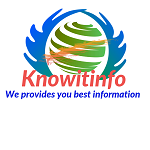 It is referred to as interior border gateway protocol, internal BGP, iBGP. In contrast, the internet application of the protocol may be referred to as Exterior Border Gateway Protocol, External BGP and eBGP. 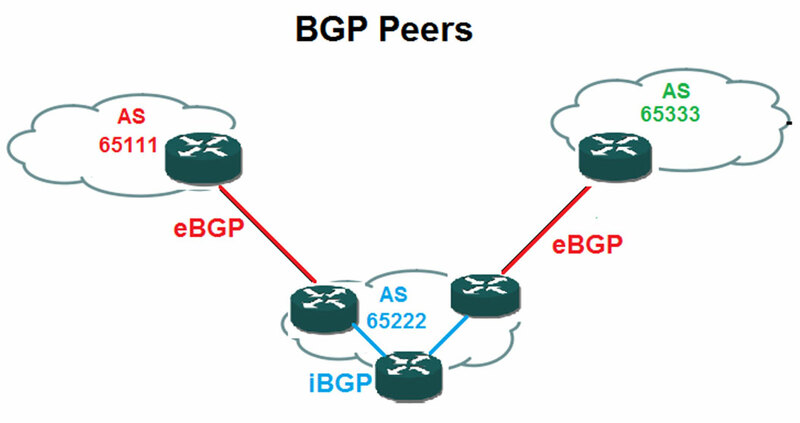 BGP neighbours, called peers. Peers are established by manual configuration between routers to create TCP session on Port 179. BGP sends 19 bytes every minute for maintain the connection. 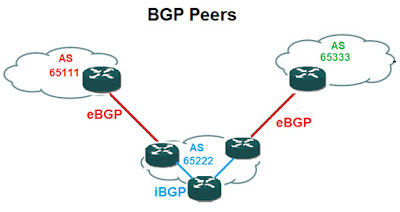 When BGP runs between two peers in same autonomous system, it is called Internal BGP (IBGP). When BGP runs between different autonomous systems, it is called external BGP (eBGP).